Last things first; since that seems the easiest way to try to sum up this episode and season. Kevin and Dr. Eleanor O’hara both know that Jackie’s been lying to them and using drugs. Jackie angrily denies these accusations and runs upstairs into the bathroom. She then stared into the mirror and fantasizes about being alone on a beach. Next, she says, “my name is Jackie and I’m an addict” with pained, bloodshot eyes. Finally, she says “blow me.” and laughs. In season one’s finale, viewers saw Jackie on the floor of a storage room after taking drugs, fantasizing about Kevin and her daughters laughing and united. In a way it reminds of the scene from the comedy Date Night, in which Phil (Steve Carrell) accuses Claire (Tina Fey) of fantasizing about being with other men. She calmly replies that her fantasies are her being alone in a hotel room sipping soda without having to worry about husband or children. (Any surprise she drove off and left Kevin walking in the street after he stormed out of the truck in fury?) Jackie’s childish flight to the bathroom underscored her desire to escape, with the “grown-ups” Kevin & Dr. O’hara wanting her to own responsibility for her actions. This was followed by the current season, which had her struggling to hold her relationship with her children together while continuing to lie and use drugs. Could season three mean that she will struggle to hold herself together as she uses drugs, lies, and tries to wean herself away from them? Probably. The audience finally learned why Dr. O’hara always seemed to be around whenever Jackie was working – Dr. O’hara checked the nurse’s schedule and aligned her schedule with Jackie’s. This,of course, begs the question of whether or not Dr. Cooper does the same thing. It would also be interesting to see a third or fourth doctor next season. On the administrative side, isn’t there anyone else in charge of that hospital besides Grace Akalitus? Doesn’t she have a boss? One of the good things about this finale is that almost all of Jackie’s lies are exposed – except for her affair with Eddie (a season 3 bombshell?). Another was to see Jackie’s nurturing side come out when Sam came to work too drunk to stand. (Is it only when someone needs help desperately that she’s kind to them? How much of herself did she see in Sam’s behavior?). The bad – what are all those bills from? (She’s been drugging for years, had free access to drugs while Eddie was there and even when the Pill-O-Matix was installed, and she now has Bill’s $12,000 stash so how did she rack up so many drug bills so quickly? It looked like several months worth.) 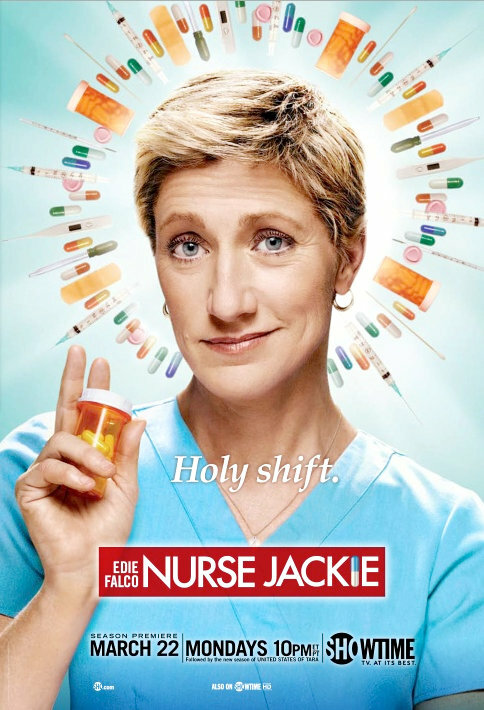 There’s been relatively little shown of Jackie actually consuming the drugs in each episode. If the writers want to depict drug addiction, let the audience know just how many drugs she’s taking, and which ones, and where she might be hiding them. Getting back to generational patterns with respect to Jackie’s behavior, Fiona and Grace are respectively like Kevin and Jackie in some key respects. Fiona is easy-going and upbeat like Kevin, and Grace is anxious, and secretive like Jackie. (I don’t think it was an accident that both Jackie and Grace retreated to the bathroom in various episodes to indulge in self-destructive behavior). Did Jackie push her mother away just like Grace has attempted to do to Jackie? If alive, what grandmother wouldn’t want to see such precious little girls? It would deepen the audience’s understanding of the characters, and make the show more interesting, not to mention realistic, if the writers were to expand Jackie’s universe a bit by bringing in her parents, siblings, childhood friends, and so on. It doesn’t make sense to introduce us to Kevin’s old girlfriend, and consistently mention that his sister is with Fiona and Grace, when Kevin has half Jackie’s screen time. Other characters got a chance to shine this season. This season has seen Zooey develop a bit more self-confidence and maturity and a relationship with EMT worker Lenny. It has also shown us a very socially inept Dr. Fitch Cooper, whose behavior raises questions about his upbringing. He reacted very strongly to the notion that a man could ever hit a woman under any circumstances, which begs the question of what prompted this response. We know that he was raised by two lesbian mothers, but we don’t know what else he witnessed in childhood. Is there some reason he thinks he should tell the full unvarnished truth at inappropriate moments? Getting punched in the nose twice should give him pause for thought, yes, be we have to wonder what’s behind some of his off-center behavior…Finally, Dr. O’hara’s bisexuality was revealed and her affairs with Sam and Sarah ended nearly as abruptly as they began. We still don’t know where her wealth comes from or why she has so many relationship troubles, but hopefully, more will be revealed in season 3. This is another show I love – this season has our titular heroine besieged on all fronts. As a mother, she’s finally realizing that Grace does indeed have some psychological problem that needs to be addressed, and finally took the phone number of a good child psychiatrist from Mrs. Akalitus in the last episode. The latest episode – “Candyland” – had her dealing with the inflated ego of Dr. Cooper, the suspicions of Zoe regarding her access code for the automated drug dispenser, and an oddly migrated set of testicles. Some people feel that Eddie, Jackie’s lover from last season, should simply move on and get over their break-up. Others may feel that Jackie brought on Eddie’s stalker-like behavior. I’m of mixed opinion. I wish Eddie would find someone new for his own well being, but on the other hand, I think that since Jackie cheated on her husband and broke her lover’s heart, she has to face the consequences. Eddie now is a friend of Jackie’s husband, Kevin, and in a position to make Jackie squirm. Let the dramatic guilt and deceit games begin anew!